Many people do not know how much of modern Christmas iconography and traditions are rooted in New York's history. Prior to the early 19th-century, Christmas in America was a far more low-key holiday than it is today… a quiet religious holiday for families, celebrated differently (if at all) across the young nation. 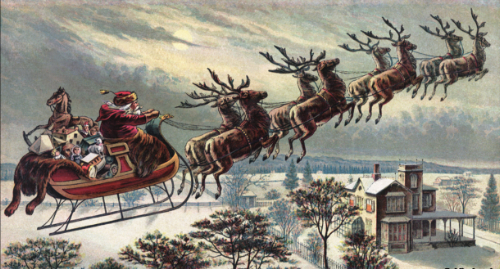 The first major connection between New York and the global Christmas mythology comes from writer Washington Irving (of "Rip Van Winkle" & "The Legend of Sleepy Hollow" fame). Upset that there were few unifying holidays in early America, Irving worked to change that. In his 1809 “A History of New York” (a comical retelling of the city's Dutch era), he declared the European gift-giver St. Nicholas to be the state’s patron saint, claiming that his image appeared on the masthead of the first Dutch ship to arrive in New Amsterdam. St. Nicholas Day, or the Feast of St. Nicholas, was for much of history a separate holiday in on December 6 associated with the gift-giving saint. One way this holiday was celebrated was placing shoes in the foyer before bedtime the night before. The origin of Christmas stockings? St. Nicholas then himself became tied to the Christmas holiday thanks to another author, Clement Clarke Moore, who lived in a mansion on Manhattan farm land in what later became the Chelsea historic district. 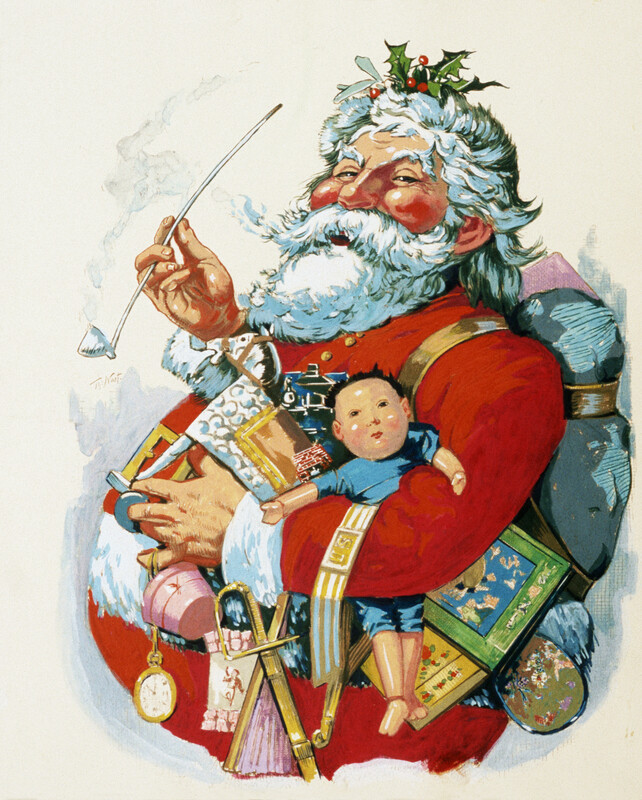 In his famous short story, “An Account of a Visit from St. Nicholas", originally published in 1823, Moore described the saint as “a right jolly old elf,” based on “a portly rubicund Dutchman,” in the neighborhood, with his “eight tiny reindeer,” with some other elements borrowed from Irving’s version of the Saint. St. Nicholas Day is traditionally celebrated in early December, but Moore’s poem set his visit on Christmas Eve, informally tying St. Nicholas to the holiday for the first time. This, in turn, ties the concept of gift-giving to the holiday. It cannot be overstated how much of our modern Christmas mythology originates from Moore’s story and depiction of “St. Nick”. Then, in the 1860s, American political cartoonist Thomas Nast further cemented this depiction with drawings in the NY-based publication Harper's Weekly depicting St. Nick/Santa Claus as a jolly, bearded, fat man in a fur-trimmed cap. This iconic look is the one that since became the default style worldwide for depicting him. More traditions kept piling up throughout NYC history... Santa's inclusion in Thanksgiving parades, public Christmas trees, decorated store windows, and more. Today, Christmas remains New York's most enchanting season, and is the busiest tourism season for the city. Holiday markets, elaborately-decorated trees everywhere, bell-ringers... between Thanksgiving and Christmas Day itself, you are hard-pressed to find anywhere in Manhattan where the holiday is not front and center. Looking to experience this magic? Contact us for a custom tour! I've added a new, seasonal tour to my listings on Viator. This is a great & festive walking tour from Columbus Circle down to Macy's in Herald Square. Along the way, the tour will pass the numerous window displays & decorations down 5th avenue, visit St. Patrick's Cathedral & Rockefeller Center, and see many outdoor holiday markets. This is going to be a fun tour that I am excited to share with you. Starts next week for one month. It can be booked here. The Christmas season is NYC's busiest time of the year for tourism... with entire streets blocked to traffic, buses re-routed, etc, to make room for the masses swarming midtown for the holidays. Everyone knows the popular attractions: The Rockefeller Center tree, the windows along 5th Ave, ice skating rinks, holiday shops galore, and St Patrick's Cathedral. But lesser known, though quickly becoming more and more popular, are the lights in Dyker Heights during that season. Dyker Heights, an isolated and suburban neighborhood in southwest Brooklyn, does not get many visitors... except in December, when tourists flood its streets after dark every night. Starting in the 1980s, residents began decorating their large homes in increasingly elaborate ways. There is now an unspoken competition among the home owners in the neighborhood, with many hiring professional Christmas decorating companies to fill their front yards with lights, blow-up characters, and intricate designs and displays. This has turned Dyker Heights into the most festive neighborhood in all of New York for the holidays. I will be offering a walking tour of this neighborhood many evenings in December (stopping for cocoa on the way! ), and will make it easy for all to navigate it, and return you to the nearest subway at the end of our expedition. Come see what all the fuss is about! Interested? Contact me for details!